COLORADO SPRINGS, Colo. (NNS) -- United States servicemembers and British armed forces members totaling more than 200, opened the 2012 Warrior Games at the U.S. Olympics Training Center in Colorado Springs, Colo., April 30. The 2012 Warrior Games opening ceremony began with the presentation of colors by NORAD-USNORTHCOM Joint Color Guard followed by the athlete processional. The warrior athletes walked the Olympic path while family and friends cheered. Following the processional was the symbolic tradition of carrying the Olympic flame. Representing team Navy/Coast Guard as torchbearers were retired Coast Guard Lt. Sancho Johnson and retired Navy Master-at-Arms 3rd Class Nathan DeWalt. Johnson, a three-time competitor in the Warrior Games, understands the honor and commitment it is to himself and his teammates to represent the team and the Coast Guard as torch-bearer. "[The Warrior Games] provides a platform to give your best," said Johnson. "Because I'm representing the team I'm going to give a bit more." Having participated in the Warrior Games since the inaugural year, DeWalt has seen the games grow in popularity and has realized the impact being part of the 2012 Team Navy/Coast Guard had on the community and families. "I felt honored and privileged to represent the team," said DeWalt. "It is a big event for the families with all the media attention." Marines who want to progress through the ranks of noncommissioned officer and staff noncommissioned officer frequently have the opportunity to go through leadership courses such as corporals and sergeants courses. These courses provide the basic fundamentals essential for Marines to lead their subordinates and provide structure and stability both in combat and in garrison. For Wounded Warrior Marines, the possibility of attending leadership courses wasnt previously an option. Today, the Corps is bringing the courses directly to the Marines. A group of Marines who sustained injuries during deployments graduated the first Wounded Warrior Corporals Course at the Walter Reed National Military Medical Center Bethesda, Md., Jan. 17. The detachment staff wanted something to help these Marines continue their professional development, said Gunnery Sgt. Boris Peredo, instructor with the Staff Noncommissioned Officer Academy at Marine Corps Base Quantico, Va. Peredo was one of three instructors who volunteered to teach the two-week course. 08.15.2011 Story by Cpl. Benjamin Crilly SANGIN, Helmand province, Afghanistan - The Marines of 1st Platoon, Company B, 1st Battalion, 5th Marine Regiment, executed the type of operation most people only see from the backside of a video game controller. From that perspective gamers only see the firefights and the destruction of targets to achieve some notional mission. What game enthusiasts don’t see on their flat screens are the logistical challenges, social constraints and cultural considerations the Marines of 1/5 overcame to accomplish their mission. FORT DRUM, N.Y., April 21, 2011 -- They don helmets, mouth guards and knee pads about five days each week. They raise families and hold down careers while their husbands fight for a peaceful nation. And they love to blow off steam by plowing through groups of roller skaters. The women of the Black River Rollers, especially the military spouses, hold it together as a team and have each others' backs - on and off the course. Photo Credit: Jennifer Caprioli, USAG Fort Drum. Black River Rollers from left, Whitney Walker, Amanda Moore and Kristy Pastrano, all military spouses, block the Wilkes-Barre Scranton Roller Radical skaters during Saturday's bout at the Watertown Arena. The skaters busted their way along the Watertown Arena's 130-foot roller derby course Saturday, during the Black River Rollers' first-ever bout. OffDutyGamers.com is a video game website run by active duty and prior service veterans and created for the same. Over the years our military men and women have been out in the field fighting with little or no time for the chance at winning contests so Off Duty Gamers is sponsoring a military contest! For the first time in its history Medal Of Honor is set not in WWII but in the current conflict in Afghanistan. Off Duty Gamers is using that backdrop as a source to bring some real life to this game by mixing Medal of Honor's fictional units with real combat troops in Afghanistan. The contest has a couple steps but is pretty simple. PC Gamers – from dungeon-crawlers and dragon slayers to all-out World of WarCraft fanatics – are often dismissed as being out of touch with reality. But the allure of PC games and their ability to engage and transfix have become a powerful recruitment and training tool. A reference to role-playing games, or (RPGs), a family of games in which players assume the roles of characters in a fictional setting and act out these roles within a narrative. The genre began with pen-and-paper RPGs, spawning thousands of games since they first appeared in the 1970s. These dedicated gamers caught the eye of the US Army in the 1990s when it first realized that the long hours spent in virtual gaming worlds could be an ideal medium to introduce potential young recruits to the military and help train them. That was when the idea for America’s Army was born. 06.23.2010 COB ADDER, Iraq – The Contingency Operating Base Adder community was treated to a night of high-flying acrobatics and smiling faces, courtesy of the X Games Tour, which made a stop at Memorial Hall, June 17. Jen O’Brien, professional skateboarder from of DeLand, Fla., Jay Eggleston, professional BMX rider from Denver, Anthony Furlong, professional skateboarder from Tampa, Fla., Keri Herman, professional snowboarder from Breckenridge, Colo., and Brad Simms, professional BMX rider from Laplata, Md., came to COB Adder as one of the final stops in their 20-location tour throughout Iraq and Kuwait. 06.09.2010 WASHINGTON - Several members of the Washington Redskins joined forces with the USO and the Wounded Warrior Project here June 8 at the ESPN Zone for a "Guitar Hero" video game showdown with soldiers stationed in Basra, Iraq. The event is known as "Pro vs. GI Joe," a video game competition meant to connect today's professional athletes and U.S. servicemen and women stationed overseas. Greg and Addie Zinone came up with the idea of "Pro VS. G.I. Joe" while Addie, an Army reservist, was deployed to Iraq in 2008. 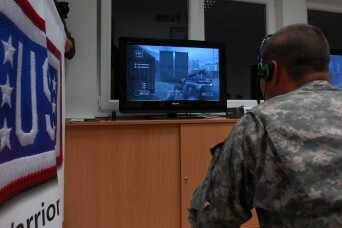 "Troops spend a lot of their downtime playing video games overseas," Addie said. "When I told Greg about that, he thought of a way we could kind of give back to the troops [through] playing video games." That's how the "Pro vs. GI Joe" project was born. 04.30.2010 DIYALA, Iraq – A Soldier in digital camouflage with body armor and an M-4 rifle equipped with an M-203 grenade launcher sneaks quietly down to the end of an alleyway. He peeks out to observe the urban environment, and spots an enemy combatant in a window. He pulls back, readies his M-203, aims around the corner and flawlessly sends a grenade through the window, destroying the enemy. As he prepares to venture out into the road to observe further, he falls down, mortally wounded after being stabbed in the back from an unseen enemy with a knife. The World Bank Institute, the learning arm of the World Bank, has launched an online computer game called EVOKE, designed to get young people involved in finding solutions to urgent problems like hunger, poverty and education. The winners of the 10-week game could be mentored by social innovators and business leaders and win a trip to a conference in Washington D.C. In July, President Barak Obama visited Russia for the first time, meeting with Russian President Dmitry Medvedev, in an effort to improve relations. But in the world of video games it appears Russians will continue to be the bad guys. Despite efforts by the United States and Russia to move forward in their relationship, old stereotypes are hard to kill. Two long-awaited video games were released last week in Europe, "Battlefiled: Bad Company 2" and "Tom Clancy's Splinter Cell: Conviction" and they depict Russians as the enemy. U.S. gamemaker Electronic Arts' Swedish-based DICE design team produced "Battlefiled: Bad Company 2" and "Tom Clancy's Splinter Cell: Conviction" was developed by French video game producer Ubisoft's Canadian studio. WASHINGTON (1/26/10) -- Think interactive video games are a waste of time or more suited for children? Think again. Research under way by the Office of Naval Research indicates that video games can help adults process information much faster and improve their fundamental abilities to reason and solve problems in novel contexts. "We have discovered that video game players perform 10 to 20 percent higher in terms of perceptual and cognitive ability than normal people that are non-game players," said Ray Perez, a program officer at the ONR's warfighter performance department in a Jan. 20 interview on Pentagon Web Radio's audio webcast "Armed with Science: Research and Applications for the Modern Military." CONTINGENCY OPERATING BASE BASRA, Iraq – The game is dominoes on this autumnal night in Camp Savage. As Maj. Joan Carrick shuffles the small spotted tiles you can hear them tinkle as they skid around the card table. Across the table sits Carrick's dominoes partner, Staff Sgt. Larry Saunders. To her left and right sit her opponents for the night: Capt. Timothy Vandewalle on her right, and Denzel, an interpreter, on her left. By day, the four members of Multi-national Security Transition Command-Iraq, help develop and equip the Iraqi security forces. But late at night, whenever they gather around the table and break out the bones, they have a chance to connect with their Iraqi coworkers over the friendly competition of an ancient game, a game where the loudest language spoken is the clickety-clack-clack of dominoes. 09.29.2009 CAMP AS SAYLIYAH, Qatar – U.S. service members gathered in the United Service Organization Qatar lounge to play networked games against the Tampa Bay Buccaneers at Camp As Sayliyah, Qatar, Sept. 29. In partnership with USO Qatar, the event was organized by Pro vs. GI Joe, a nonprofit organization that connects professional athletes and celebrities in heated real-time video game competitions with troops overseas. Pro vs. GI Joe events, sponsored by USO Qatar, have been boosting troop morale at Camp As Sayliyah since May. The impact is felt throughout the region, given that the USO lounge is located within the only authorized U.S. Central Command rest and recuperation pass program facility in Southwest Asia. Since 2004, almost 200,000 service members have sought respite at the Qatar base. Regina Wilhite, USO Qatar duty manager, facilitated the Tampa Bay Buccaneers Pro vs. GI Joe event at Camp As Sayliyah. Service members played against professional football athletes using two Xbox games: "Guitar Hero Smash Hits," a rock band simulator that groups players into full stage performances; and "Call of Duty 4 Modern Warfare," a first-person shooter that mimics combat in global hot spots. FORT BENNING, Ga. - Players from the Atlanta Falcons took time to play video games against Soldiers representing the 3rd Heavy Brigade Combat Team, 3rd Infantry Division, and Soldiers currently deployed to Qatar and Afghanistan Sept. 15, at the Falcon’s training facility in Flowery Branch, Ga.
09.08.2009 CONTINGENCY OPERATING BASE BASRA, Iraq – Being called a loser is never pleasant. Well, almost never. For 28 Soldiers at Contingency Operating Base Basra, the label is not only fitting, it's also something to be proud of. These Soldiers competed recently in COB Basra's version of The Biggest Loser, with goals of losing weight, trimming body fat and generally increasing physical fitness. Sgt. 1st Class Ricky Mathison, a platoon sergeant with Network Support Company, Special Troops Battalion, 34th Red Bull Infantry Division, facilitated the eight-week competition, which featured four teams with names like "Muffin Tops," "Thunder Thighs," "Chubs" and "Fatty 4's." 1st Lt. Eugene Harrigan, an automation technician with the information section of 34th Inf. Div., works out at a local gym on COB Basra, Aug. 31. Harrigan recently participated in Basra's Biggest Loser, a weight loss and fitness competition held at COB Basra. The new "America's Army 3" game can be downloaded from the Web site at http://www.americasarmy.com Photo Credit: AA3. WASHINGTON (Army News Service, June 16, 2009) -- Thousands of gamers will be able to play "America's Army 3," the newest version of the Army's popular video game, beginning Wednesday. The original game has been out since July 4, 2002, but the new version will provide gamers with improved features, thanks in part to the use of Unreal Engine 3. SILVER SPRING, Md. (Army News Service, Feb. 9, 2009) - The America's Army PC game, which lets players explore Soldiering, has been recognized with five records in the upcoming Guinness World Records 2009: Gamer's Edition. LANDSTUHL REGIONAL MEDICAL CENTER, Germany - With his right arm in a sling, Army Sgt. Steve Webb was still able to pick up arms and engage in battle against Airmen, Marines, Sailors and fellow Soldiers spread across Dubai, Japan and Kuwait, as well as a few Buccaneers in Florida. That was the worldwide battlefield on Veteran's Day for Webb and nine fellow Wounded Warriors from the Medical Transient Detachment at Landstuhl Regional Medical Center. While receiving care for medical conditions sustained downrange, the Soldiers were selected to compete in the gaming competition featuring fellow servicemembers and members of the Tampa Bay Buccaneers: quarterback Cato June, tight end Alex Smith and cornerback Phillip Buchanon. 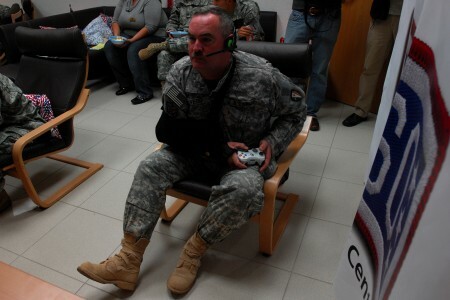 From the comfortable confines of the USO Warrior Center, Webb, a 45-year-old New Jersey Army National Guardsman, gave a good showing against the younger and more battle-hardened veterans of Call of Duty: World at War on an Xbox 360. Not too surprisingly, the military scored better on the battlefield portion of the event presented by the non-profit organization PRO VS. GI JOE. Also to be expected, the NFL proved the best when the next round of competition consisted of Madden NFL 09. But for Webb, winning took second seat to just being part of the game. "It's outstanding, especially to be here away from our units where it's really easy to think that you're forgotten about because you're not with your guys," said Webb. "But when you're here, everybody makes you definitely feel like you're not forgotten about, especially with the guys from Tampa doing this. It was really nice that they took time out in between their weekend games and play against us." The "guys from Tampa" saw it differently. "It's the least I could do," said Smith from the team's state-of-the-art amphitheater where he was able to both see on a live webcam and communicate by headset speaker while competing. "It's just a way to show our appreciation for what they're doing overseas and something as simple as playing video games with them goes a long way. Hopefully they enjoyed it." His teammate concurred. "It's Veteran's Day. It's a time to pay tribute to the guys that are protecting this country," said June. "For them, it's a time to get off and have a little fun with us. There's really nothing you can say about that. It's a great thing for the families and for the Soldiers." After the gaming, the USO Warrior Center staff helped stage a surprise video teleconference visit for Army Specialist Brandon Depew with his wife and five children in an adjacent room in the new 2,400-square-foot USO facility located between the two MTD buildings. Depew sat down expecting to be interviewed by ESPN or one of the local media covering the event in Tampa. The USO staff worked until midnight the day prior to prepare for the event. The Warrior Center is intended to provide Wounded Warriors with that special touch of home that the USO is known for among its more than 130 facilities around the world that are used more than 5.3 million times each year by servicemembers and the family members. "It's their home away from home," said USO Warrior Center manager Melissa Parkins, one of several USO staff members and volunteers coordinating the event from Germany. The gaming room, she said, is probably the closest thing to being at home for the Wounded Warriors -- or "my kids" as she jokingly calls them -- to unwind and talk as Soldiers can only talk with one another, while receiving medical care at LRMC. For Webb, sharing the gaming experience with fellow Soldiers on Veteran's Day at the USO Warrior Center proved a winning combination. "It's really nice if you think about it -- everybody who has served prior, and the young people who are going to serve after us. No matter where you go you have that family, whether you're at Germany, Iraq, Korea or CONUS. Once you're on a military post, you're home."